Finely crafted furniture made in Oakland, Calif.
Woodtech specializes in crafting a unique furniture vision for each client. 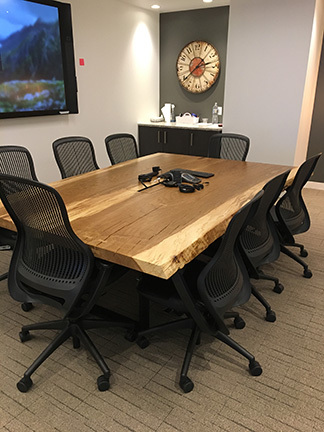 Made in the USA, our specialties include conference tables, reception stations, private offices, and collaboration units. We create furniture for corporate use, for training, healthcare, education, retail and the service industries. Woodtech designs and builds furniture in innovative and unique materials such as live edge, salvaged and re-claimed wood from Northern California, fumed wood, orchard wood, acrylic, resin, glass, metal, stone, and solid surface material in addition to FSC new hardwoods and veneers. With over 20 years of experience and over 100,000 square feet of manufacturing space, Woodtech follows the most stringent environmentally responsible standards in the United States. Through its use of solar panels and skylights, Woodtech has eliminated traditional energy sources to power the company’s 100,000 SF production facility in Oakland, Calif.
Woodtech has installed 650 photo voltaic solar roof panels which generate 316,000 kilowatt hours annually. In addition, Woodtech has installed over 90 high performance prismatic skylights throughout the plant. Our factory is a participant to the Carbon Disclosure project (www.cdp.net), supplying energy data to this non-profit charity with the goal to improve sustainable global business efforts. Each year since 1993, investments are made in sustainable production technology.